It’s the liquid you pour onto your finger after you accidentally cut yourself while doing the dishes. 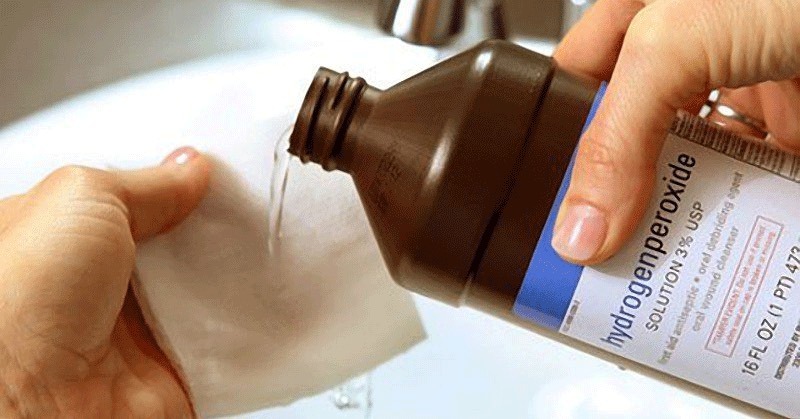 It’s what you use to disinfect your child’s knee after a fall, but did you know that there are so many other uses for hydrogen peroxide that you can start using in your home? FACT: Pure hydrogen peroxide can explode when you heat it to its boiling point. 1. Eliminate Viruses: You can use about three drops of 3 percent HP in each of your ears. Some experts say doing this can greatly reduce the duration of a flu or cold. Once you apply the drops of HP, let the HP sit for about 10 minutes before allowing it to drain. Another benefit is that it will take the ear wax with it! 2. Get Rid Of Pesticides: Most fresh vegetables are produced using spray pesticides. These are harmful chemicals that you don’t want to consume. Add about ¼ a cup of HP to a bowl with 3 cups of water and allow your vegetables to soak in it for about 30 minutes. Rinse the veggies well and leave them in the refrigerator for a while to dry out. 3. Get Rid Of Airborne Germs: If you have a humidifier, you can mix 1 pint of 3 percent HP with one gallon of water and add it to your humidifier. Let the humidifier run until the mixture is depleted. 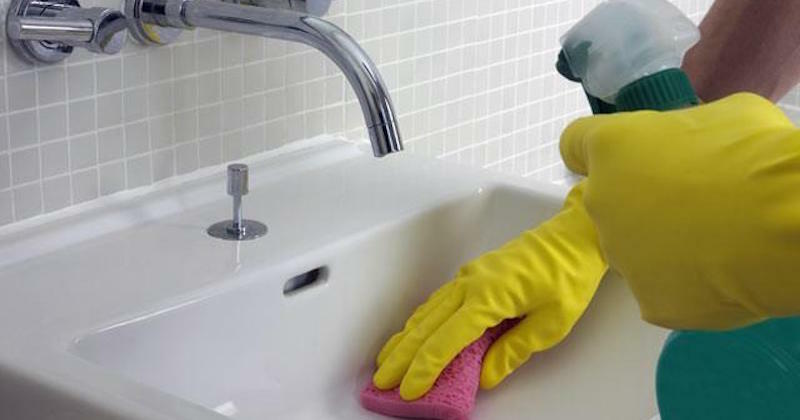 The disinfectant and antibacterial properties of the liquid will eliminate airborne germs. 4. Whiten Your Teeth: In case you didn’t know, the active ingredient in most teeth whitening products is HP. It can whiten your teeth naturally by oxygenating the surface of your teeth. First, brush your teeth normally with toothpaste. Next, mix 2 teaspoons of water with 1 teaspoon of 3 percent HP. Swish this mixture around in your mouth for up to 60 seconds but make sure you don’t swallow any of it. When you’re finished, rinse your mouth with water and do this up to three times a week. 5. Bleach Finger And Toe Nails: When you remove nail polish, often your nails may be discolored. To reverse them back to your normal color safely, use the standard diluted HP product that you buy from the store. Pour some into a small container or bowl and dip your finger and toe nails for 5 minutes. Do this for a few days consecutively till you achieve your desired result. 6. Bleach Hair: When compared with other household bleaching agents, HP is milder and safer, so you can use it to bleach your hair. 7. Create Hair Highlights: Just spray some HP onto damp hair, and it will give you sun-bleached highlights. Allow it to sit on the hair for up to 15 minutes before you rinse it off. 8. Rejuvenate And Detox: You can soak in a bath with some HP, and it will rejuvenate and detox your body. Pour 1 cup of 35 percent HP into a tub of water. Soak in the tub for about a half an hour and feel the benefits of the HP. 9. Eliminate Stuffy Sinuses: When your sinuses are stuffy, it can be painful. Unclog them with a homemade nasal solution containing HP. In most cases, you can mix 1 cup of water with 1 cap full of HP. If your sinuses are really stuffed, you might consider a slightly more concentrated mixture of HP. 10. Stop Toothache Pain: We’ve all had a toothache at some point in our lives, so you know how painful they can be. To soothe some of the pain, you can do oil-pulling with a mixture of coconut oil and HP. The antibacterial properties of coconut oil and HP help to eliminate the bacteria that are causing the toothache pain. 11. Disinfect Wounds: HP works very well to disinfect most small wounds. In most cases, a small cap full of a standard 3 percent solution will do the trick. Wash the wound with a 3 percent HP. 12. Make An Antiseptic Mouth Rinse: It’s true that HP can whiten your teeth, but it’s also effective as a mouth wash to reduce bad breath that is caused by bacteria. Mix 1 cup of water with about 2 caps full of HP and use it to rinse out your mouth. 13. Eliminate Acne: If you have acne, create a face rinse that can clear up the acne. Use a mixture of 2 tablespoons of 3 percent HP and 2 tablespoons of ACV. Dip a cotton pad on this mixture and pat it on your face on affected areas to eliminate the bacteria that cause acne breakouts. Do not use the same pad for the entire face, but use clean pads to pat new areas to prevent transference of the bacteria. 14. Get Rid Of Boils: You can use HP to get rid of boils. Just fill up your bathtub with water and a single cup of 35 percent HP. This mixture of bath water and HP will treat boils, but it will also rejuvenate and detoxify your body. 15. Soften Calluses And Corns: If you need to soften calluses and corns to get rid of them, just soak them in a mixture of equal parts HP and ACV. This mixture will naturally soften most corns and calluses. 16. Get Wax Out Of Your Ear: Most people have an enormous buildup of wax in their ear and don’t even know it. Get rid of it with 2 drops of HP in each ear. After adding the HP to one ear at a time, add a couple drops of olive oil. Wait a couple of minutes and drain the solution out of the ear. Most of the wax will flow out with the HP. 17. Prevent The Dreaded Swimmer’s Ear: Also known as swimmer’s ear, a typical ear infection is no fun! To get rid of it, just mix 1 cap of HP with some ACV in a small dropper bottle. After swimming, just apply a few drops of this solution to each ear to prevent infection. 18. Get Relief From Ear Infections: By applying about 8 drops of HP to an infected ear, you can ease many of the symptoms and clear out the infection. 19. Eliminate Skin Mites: Many people suffer from skin mites. You can use HP to kill them off. Spray some 3 percent HP on the affected skin. Repeat this process a few times after a few minutes, and it will kill skin mites. 20. Get Rid Of Foot Fungus: Mix equal amounts of 3 percent HP with water inside of a darkened bottle. The bottle needs to be darkened because HP cannot be exposed to light. Apply the mixture to foot fungus. 21. Make A Marinade For Poultry, Fish Or Meat: You can marinade meats by placing them inside a casserole that contains equal parts of water and HP. The casserole should be loosely covered and refrigerated for about 30 minutes. Make sure to rinse the items before cooking. 22. Disinfect Your Toothbrush: To maintain optimal oral hygiene, ensure your toothbrush is clean. You can disinfect a toothbrush by soaking it in HP. It will kill all of the bacteria that are known to thrive in the bathroom. 23. Remove Stubborn Stains From Clothing: One of the most difficult stains to remove from clothing is blood. You can pour some undiluted HP directly onto the stain, allow it to sit for about 1-3 minutes and rinse it off using cold water. Then scrub with a bar soap to totally remove the stain. Repeat the process as needed. 24. Control The Growth Of Fungus In Aquariums: If you own an aquarium, this is a brilliant way to use HP. You’ll have to check elsewhere to find the exact instructions, and you’ll also need to be careful because you don’t want to harm your fish. 25. Make An Emetic For Household Pets: It’s not uncommon for dogs and cats to fall ill after eating certain foods that they shouldn’t have eaten. HP can induce vomiting. This also works well if your dor or cat has swallowed something they shouldn’t and HP can make them throw it up. 26. 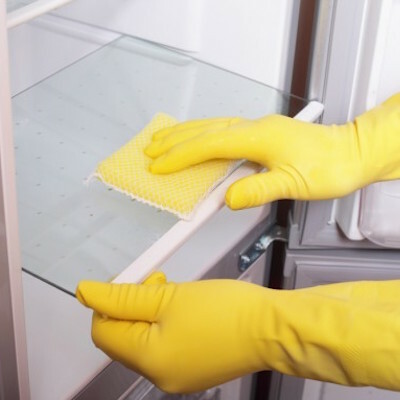 Use As A Dishwasher Detergent: While it’s not a perfect substitute for dishwasher liquid, HP is always an option. You can make the last of your dishwasher detergent last longer by mixing some HP with it. 27. Create An All-Purpose Cleaner: Most people understand that your typical all-purpose cleaner can get expensive. Just fill a spray bottle with a diluted mixture of HP and use it to clean almost anything. 28. Clean Your Contact Lenses: If you wear contact lenses, then you can clean them with HP. Just soak your contacts into a diluted solution of HP overnight. It will get rid of protein buildup and make them ready to wear the next day. 29. Make Laundry Whiter: Over a long period of time, you’ll notice that your white laundry items can get dingy and yellow. Just add 1 cup of hydrogen peroxide to the wash and let the laundry soak for 30 minutes before wash.
30. Remove Organic Stains: Sweat, blood, wine and coffee are all considered organic stains, and they can be difficult to remove. Just make a mixture of 1 part dish detergent with two parts HP and apply the mixture to the stains. However, it’s important to remember that HP can bleach darker colored fabrics, so you need to be careful with what you use it on. 31. Eliminate Undesirable Odors: Over a period of time, your fabrics can get bogged down with odors. Just make a mixture of white vinegar and hydrogen peroxide and soak the fabrics in it. All of the unpleasant odors will be removed. 32. Clean Carpets And Rugs: A number of homeowners use HP to clean dirty carpets and rugs. It’s especially useful on light carpets because it can bleach darker colors. Spray a diluted solution onto the rug or carpet and clean it as you normally would. Always do a spot test beforehand to make sure it won’t bleach the fabric. 33. Disinfect Your Lunchbox: It’s true that lunchboxes can accumulate a lot of bacteria. Spray your lunchbox with a diluted solution of HP. Let the hydrogen peroxide solution sit for a few minutes; wipe it away. 34. Keep Your Shopping Bags Fresh: A reusable shopping bag is great, but it can get really dirty. You can disinfect and remove odors from any reusable shopping bag by spraying it with some HP, let it sit for a few minutes and wipe it off with a clean paper towel. 35. Improve The Germination Of Seeds: In case you didn’t know, fungal spores can impede the germination of seeds. All you need to do is soak seeds in HP before planting them, and it will remove fungal spores from them. 59. Prolong The Freshness Of Your Vegetables: You can use HP to prolong the freshness of your vegetables. Add about ¼ a cup of food-grade HP to a sink full of cold water and throw your veggies into it. Let them soak for about 30 minutes. Then, rinse them and shake out excess water. Dab dry with clean paper towel, pack them back in a clean plastic bag and store them dry in the fridge, to prolong the freshness. Now that you’ve seen the list—you know what this amazing liquid is capable of. Do you know that it’s also found in ALL living materials? Did you know that the white blood cells inside of your body produce it naturally? This article is shared with permission from our friends at wakingtimes.com.